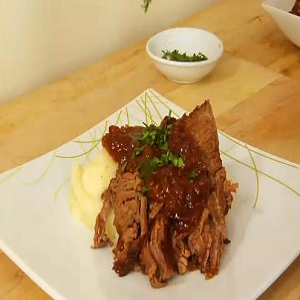 Beef brisket in beer makes very juicy beef, enriched with the irresistible flavors of broth and beer. The way it is cooked helps in infusing all the juices in the beef to bring out its taste. The recipe may seem difficult at a glance but is fairly simple once you start. The gravy and beef make it a perfect dinner for a cold winter evening. Make this recipe and enjoy a hearty dinner with your family. Preheat your oven to 350 degrees. Wash the brisket to make sure it’s clean and pat it dry. Season the beef with salt and pepper. Turn your stove to medium high and heat the oil in a heavy bottom pot. The oil should become hot but shouldn't burn. Put the meet in it and let it brown evenly from all sides. This will take a total of 10 minutes. Lift it with the help of a tong and transfer to a plate. Using the same pot, add onions and bay leaf in it. Adjust your heat to moderate high. Let it cook in the fat contained in the pot for around 12 minutes, keep stirring often. Remove the onions form the heat and put half of them in a bowl. Let the remaining onions stay in the pot. Put the brisket on the onions and add beer, vinegar and bouillon cube. Put the other half of the onions on top. Let it come to a boil. Put the lid on the pot and cover it. Let the meat braise in the oven for around 3.5 hours. By this time, it will become tender. Then take off the lid and let it cool for 30 minutes. Take the meat out of the pot and put it on a cutting board. Take off the excess fat from the sauce and sprinkle salt and pepper on top. Cut the meat across the grains and serve it with sauce on the side.